Giant alien insects from another planet invade, planning to colonize and take over the Earth. The aliens assume the form of dead humans and try to employ space monsters to abolish mankind. Godzilla® and spiny ally Anguirus unite against two of the series’ most popular opponents: the three headed monster King Ghidorah™ and the new alien cyborg Gigan™. Giant alien insects raid, planning to take over the Earth. The aliens assume the form of dead humans and try to employ space monsters to abolish mankind. 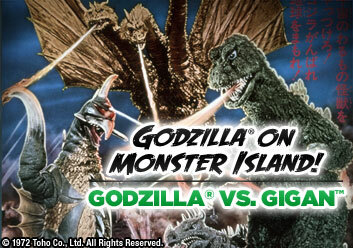 Godzilla and ally Anguirus battle against two gargantuan opponents: King Ghidorah™ and Gigan™.